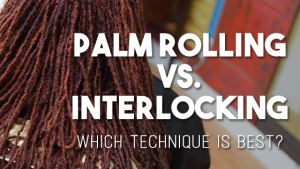 The Great Debate—Palm rolling vs Interlocking. Is one better than the other? Which one locs hair faster? Will my hair be damaged from switching? The list goes on with questions circulating amongst the natural hair community about palm rolling vs interlocking. Whether you’ve arrived here for reasons of repair, longevity, or just curiosity, I’ll share with you the advantages and disadvantages of each technique to help you decide what’s best for your hair. Palm rolling is a maintenance technique in which the palms of your hands roll (or twist) the hair into a circular formation. This technique is mainly used on traditional and semi freeform locs. Interlocking is a maintenance technique in which the end of the loc is pulled through the root to tighten the nugrowth to the scalp. This technique can be achieved with a tool or with fingers; and it is commonly used in the Sisterlocks™ and micro locs hair locking systems. Fundamentally, the two techniques— palm rolling and interlocking— are very different, but let’s explore the advantages and disadvantages of each technique to help you understand which method would be best for your hair. Time-Saving. On average, a Loctician can complete your palm-roll maintenance within 45 minutes-1 1/2 hours, whereas interlocking maintenance can take upwards of 3-4 hours when professionally maintained. Simple. 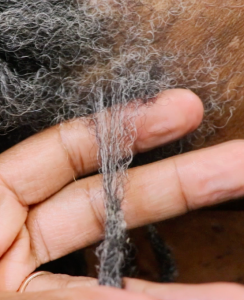 By using your hands to cultivate the locs, the palm-roll maintenance is simple enough to be done on your own. However, any professional Loctician will tell you there are specific angles that help prevent unraveling, clip organization will keep your maintenance in longer, and maintaining the parting system is not easily replicated at home without training. Longer Lasting Maintenance. The time that you wait between maintenance sessions is considerably different when you maintain your locs with interlocking. On average, you’ll have your locs maintained every eight weeks, compared to once a month with palm-rolling. For all hair textures. Interlocking is a technique that can be used to start and maintain any texture of hair because it prevents the hair from unraveling and encourages the hair to stay in place to begin the locking process. Over manipulation. With too much retwisting / palm-rolling you can drastically thin out your locs or even trigger baldness in an attempt to “keep your locs neat”. Unraveling. Often times with DIY Loc Maintenance, not protecting your hair at home, or while working out can cause your locs to unravel at the roots. Smaller locs. 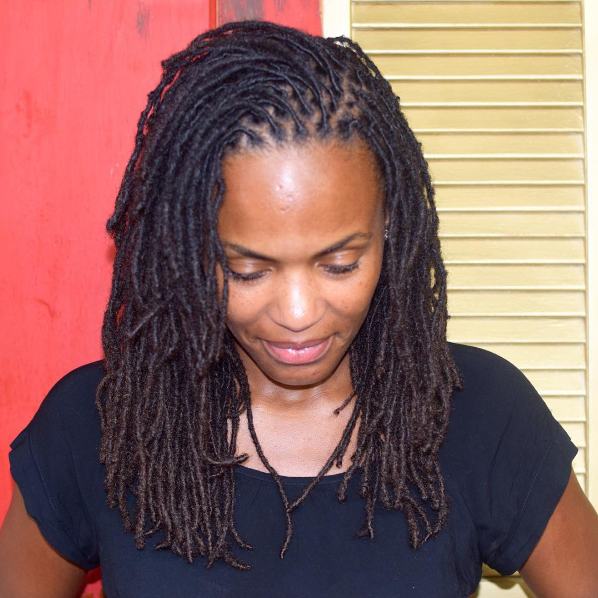 Interlocking is better suited for smaller locs, both in size and density. 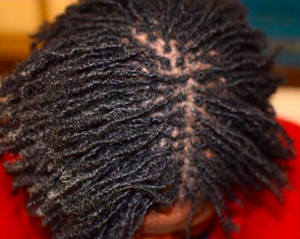 What this means is that it is very rare to see thicker sets of locs that are maintained with interlocking. Potentially Damaging. There is a specific technique that is used with interlocking and when it is not executed proficiently it can produce holes in the locs which can lead to breakage and thinning. Also, if the correct amount of tension is not used, this can cause locs to thin at the roots or trigger traction alopecia. So, is palm-rolling better than interlocking? In my professional opinion, I don’t think so; rather I believe that the maintenance technique is dependent upon the expertise of the individual executing it. If you’re not trained on interlocking techniques, you can cause irreversible damage, but you can also create problems with improper palm-rolling. I encourage you to consider your lifestyle, budget, and accessibility to a professional when determining which method would be best suited for your hair. Seeking advice from a Professional, if only through a consultation, and asking very detailed about concerns you may have will allow you to be proactive (instead of reactive) with healthy hair care. Next week, I’ll be sharing the answer to another common question “Can You Switch Between Palm Rolling and Interlocking?“. In the comments, share which method you use to maintain your locs and add any more advantages (or disadvantages) that you can think of! Just starting my locs. My hair is very fine and very curly. But when wet go completely straight. Big problem when trying to loc. Any suggestions on best way to get started? I am in the process of creating a course for people with soft, fine hair that want to get locs which will be available in the NuGrowth Academy. In the meantime, you can reference an article I posted a few months ago, “The 7 Methods for Starting Locs“. My locs are about a month old and I’m considering getting them interlocked.. I play basketball 4-5 days a week and I have a physically demanding job. I feel like with my lifestyle its best to get my hair interlocked so I can worry less about my hair unraveling at the roots. Thanks for this, it was a big help. Do you have a specific method you recommend using to interlock? I’ve seen a couple of youtube videos but they all pretty much had different techniques. One guy in particular, Chris McDread, seems very knowledgable and he suggests the 9-12-3 method when interlocking.. Do you have a specific technique that I can advise my loctician to use? I am so glad that this article helped you; you definitely sound like you’re a great candidate for interlocking. If your Loctician does not understand or know how to properly interlock hair, I would NOT use them for that service. You can do a lot of damage if you’re not knowledgeable about the technique. I use the interlock method to maintain my locs. I only maintain my hair every 2-3 months, and may do a light retwist in the 2 weeks before my interlocking to gather loose hairs together. After 6 years, my roots are strong, my hair is mid-back length, and where a few loc roots have thinned, I have combined them with success. I love my hair! Thank you so much for sharing your experience! I love when people can share positive experiences with interlocking because I think interlocking gets a bad connotation by people that don’t understand it. Yay! I’m so glad that it helped you make the right decision! I started my locs after retiring from the Navy and love it. My hair hated chemicals and has grown so much better now that I’m natural. I have thin hair on top, so my locs are small, and I tend to palm roll, but I have also used the interlock method. I do exercise and swim in the summers so my roots loosen and are shaggy so I interlock to hold the look better for a longer period of time. I palm roll in between interlock sessions to keep the look neat as possible. My roots are strong and I haven’t seen any problems in doing both. I just use which ever works best in the situation. As you said in the article, interlocking works better if you need to shampoo often. I trim my locs to stay just past shoulder length due to my thin top, but it’s thickening up and starting to fill in so I may let it go a bit longer. Yay! I only use water, tee tree oil and black castor oil on my hair now and it has worked wonders. Thank you for your articles and good luck with your new set of locs. I maintain my Husband s locks and I actually mix the methods. I palm roll the front and interlock the back. This helps keep the front really neat for his conservative workplace. Thank you for sharing your experience! It is true you can mix or alternate the methods to meet your needs. I have a question about budding….when the locks begin to bud, is there anything special that needs to be done? 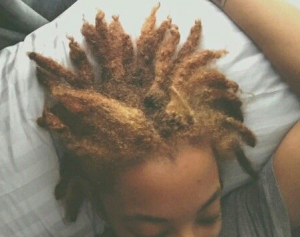 For instance, when retwisting locs using the palm rolling method, does the whole loc need to be manipulated or just the New growth? The entire loc should be maintained, not just the roots. Thank you for this great article ! I have been palmrolling for the past two years and I recently started to interlock to keep them from unravelling since I workout more. Do you think it’s a good idea to combine both techniques ? I’m glad you enjoyed it! 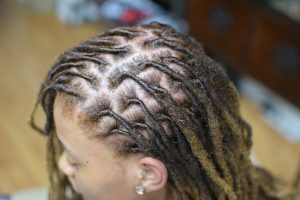 Please take a look at the follow-up article “Switching Between Palm-Rolling & Interlocking Without Causing Damage” or if you prefer to know specifically about how it is affecting your locs, please visit NuGrowthSalon.com to setup a “Virtual Consultation”. Omg looove this article so much. I get so many negative comments from people that think they know it all about the different methods of locking our hair. I’m very active and tend to sweat a lot fairly easy so I chose the interlocking method. I watched all kinds of videos and practiced and researched it before I even started mine. I’m over 5 years in now and loving it. I get so many compliments on my hair from more people than not. I love my interlocking journey. I also interlock my brothers hair because he plays basketball regularly. We haven’t experienced any thinning or breakage at all. Thank you! I am glad I just found your site. I have interlocks and I’ve been thinking about getting rid of my locks, it’s been 8 awesome years but I want a change. Can you comb out interlocks or do I have to cut them off? Hi Karen! You can definitely comb them out! I’m very happy to have found your blog! 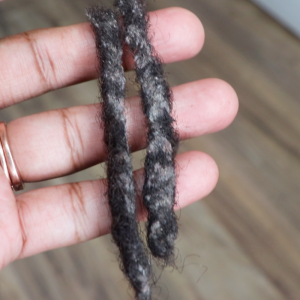 I started my locos with two-strand twists back in November 2016, and recently realized I was doing everything wrong (like washing my hair with my locs loose) so they haven’t really loced yet. I wanted to stick with semi-freeform because I want thicker locs, and because I have sensitive edges with breakage I’m trying to repair, and felt interlocking would be more stress on them. My question is whether or not you feel I should stay away from interlocking, and if so, how can I keep my locs from unraveling when I’m active. Hi Denise! I’d love to help you! Schedule a virtual consultation at your convenience so we chat get you on the right path! Hello, I really enjoyed this article. I was just wondering if interlocking shorten the loc? I have only been at this for a month now and I don’t believe I got the palm rolling down just yet. Thanks for checking out the article! Interlocking elongates that hair but in the beginning stages of locking, you will experience “shrinkage” with both methods. You said the locs can be combed out? I thought they were permanent and had to be cut off! I want locs but didn’t get them because I was afraid that if I wanted change, I’d have to cut my hair off? I Like How You Break it Down.Thank You. I’m glad it was helpful! Thank you for reading and commenting. I started my locs with 2 strand twist. After 1 month I decided to interlock because my hair is so soft. 10 days after my 1st interlock/2nd wash I noticed a lot of me locs had almost 3/4 inch of new growth. My hair does not grow that fast. Is this an indication of unraveling? Should I interlock them now or wait until 6/8 weeks? I’m afraid of thinning my roots and causing issues before my hair evens locs. I am going to assume that you’re interlocking your hair yourself… What happened is known as slippage and it is very common when you start locs with twists then try switch to interlocking. Hopefully, you are aware that interlocking will produce a thinner loc than what you see with your hair in the twists, so when looking at your roots they will appear to be “thin”, but they (hopefully) will not be thin to the point of breaking off. Less than an inch of nugrowth is no cause to do another interlocking session right now, wait the 6 weeks and then correct the issue, but make sure that your tension is correct. If you need help with DIY interlocking, I would highly recommend the “Interlocking Fundamentals” workshop for you.